With this free AutoCAD viewer, you can open and manipulate DWG files. AutoCAD Drawing Viewer is definitely not a substitute for a CAD suite like AutoCAD or other expensive software, but it is able to open, edit, print, convert and save DWG files for free. Included with this tool is also the ability to create PDF and JPG files, perform batch conversions and even find and replace text within the files themselves. A better solution to AutoCAD Drawing Viewer would probably be something from Autodesk instead such as the Free DWG Viewer which does not contain adware. Version 4.0 is a freeware program which does not have restrictions and it's free so it doesn't cost anything. 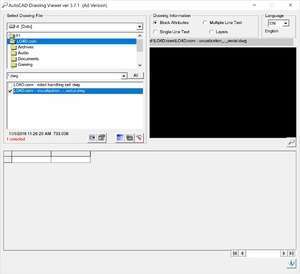 For security reasons, you should also check out the AutoCAD Drawing Viewer download at LO4D.com which includes virus and malware tests. Additional screenshots of this application download may be available, too. Featuring reviews and downloads of select 3D image design software focusing on Computer-Aided-Design applications. Check out some of the freeware downloads available in the 3d editor category. They contain no strings and are available at zero cost.